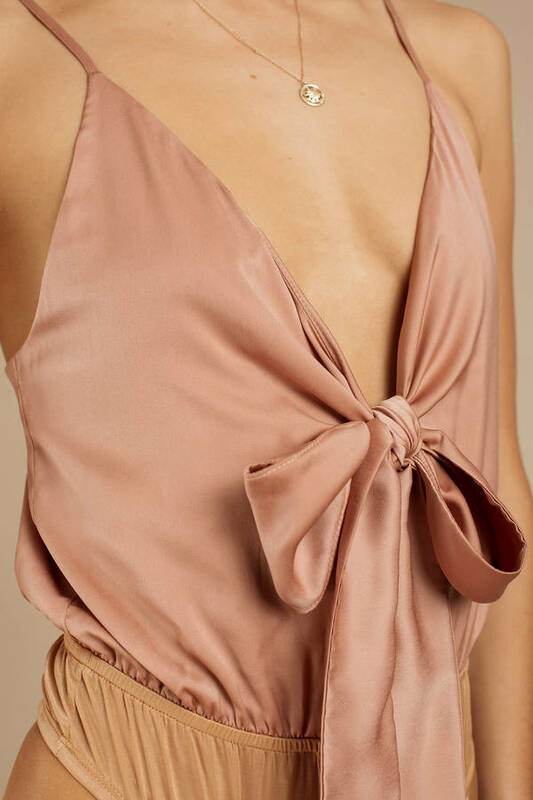 Check out Tobi's Lila Front Tie Satin Bodysuit Evening drinks just got a bit more scandalous. Get the Lila Sienna Front Tie Satin Bodysuit for your next happy hour. This spaghetti strap bodysuit features a deep plunging neckline, adjustable cami straps, front tie, and a slouchy silhouette. Pair this shiny bodysuit with a high waisted skirt. Evening drinks just got a bit more scandalous. Get the Lila Ivory Front Tie Satin Bodysuit for your next happy hour. This spaghetti strap bodysuit features a deep plunging neckline, adjustable cami straps, front tie, and a slouchy silhouette. Pair this shiny bodysuit with a high waisted skirt. Evening drinks just got a bit more scandalous. Get the Lila Sienna Front Tie Satin Bodysuit for your next happy hour. This spaghetti strap bodysuit features a deep plunging neckline, adjustable cami straps, front tie, and a slouchy silhouette. Pair this shiny bodysuit with a high waisted skirt. Ivory, Sienna modeled on a size Small.